There’s a comment that Helene Hanff makes in one of her letters in 84 Charing Cross Road about visitors to England that has always stuck with me. My parents lived in London for nearly seven years when they were first married, and their London is a combination of half-forgotten trivia like what color the Bakerloo Line is on the London Tube Map, memories of places they used to go when they were young and fancy-free (as opposed to now when they are more mature and fancy-free), and surprise at how much London has changed in the last forty something years. My London is an amalgamation of landscapes read about in Jane Austen and Charles Dickens, regency romance novels, Victorian murder mysteries, and urban fantasy novels, jumbled up with images gleaned from BBC police procedurals, Doctor Who (which admittedly is mostly actually Cardiff dressed up as London), and sweeping BBC historical dramas. After the runaway success of last year’s Christmas adventure to Curacao, we decided to reprise Christmas away from home this year. London won the site lottery for a variety of reason – there was an apartment we could borrow from my godparents for the week (they were in France with their kids); London is easy to get to for both my parents and I (unlike some of the other suggestions that got floated); and, also London is a fun city that does up Christmas right. 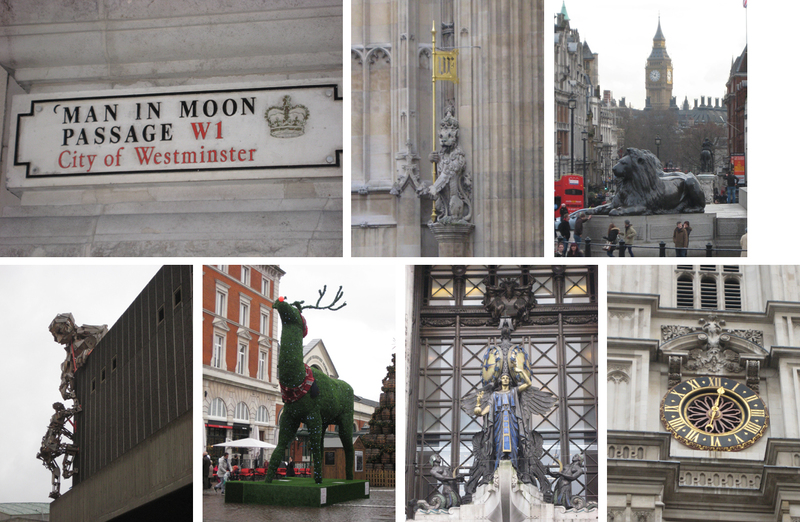 So, from December 19th to 27th we did our level best to eat our way through London, pausing intermittently to take in some culture as we attempted to digest. 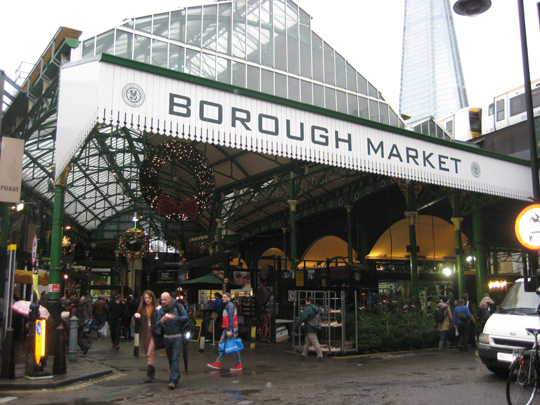 We began our cultural and epicurean tour of the city at the Borough Market tucked under the arches of the London Bridge Train Station. I’d read about it in one of the endless number of food magazines I subscribe to, and it was as fantastic as I’d hoped (particularly gratifying since this was one of the – many – places I was dragging my parents to that they might not have picked for themselves on a tour of London). It’s a very gourmet kind of farmer’s market, and we snacked our way around the stalls – Caerphilly cheese from Wales, slivers of smoked sausage from a farm somewhere outside of London, spoonfuls of the paella being cooked up in mammoth cast iron pans, wedges of cheddar and stilton from a store where the walls lined with enormous wheels of cheese. We could probably have made lunch out of the samples being given out at stalls, or split one of the enormous shredded duck meat sandwiches that everyone was walking around eating, but we had a reservation at Roast which perches above the market, and allows you to eat in a sun drenched room (even on a cloudy day it was full of light), while peering down at the busy market below. We attempted to walk off some of lunch afterwards with a stroll down the Thames to the Millennium Bridge (new since my parent’s time), and then having duly admired it we walked across it to St. Paul’s, and from thence progressed down Fleet Street to the Strand, pausing to take pictures, peer at the map periodically, and be lured into Twinings base camp by its excellently un-PC door sign. That first day in London set the tone for the rest of the trip in which we mixed food and culture in more or less equal measure. We took in museum exhibits – (me) Pre-Raphelites: The Victorian Avant Garde at the Tate Britain (verdict – the collection was (stunningly) impressive, but I thought they missed an opportunity when they chose the academic high road and skipped the salacious details of the lives of the pre-raphelite brotherhood); (my parents) the newly refurbished British headquarters of The Sovereign Military Hospitaller Order of St. John of Jerusalem of Rhodes and Malta; (my mother & I) a fashion exhibit at the Victoria & Albert (verdict – interesting, but probably should have gone to the Hollywood costume exhibit at the V&A instead); (my father) Chinese porcelain at the V&A; (all of us) the Courtauld Collection, which is small but spectacular. We partook of (and participated in – it was that kind of concert) a Christmas concert at the Royal Albert Hall, and I became the envy of everyone I know and got to go to the new Matthew Bourne ballet at the Sadler’s Wells. It was very Matthew Bourne (the man does like his half naked hot young dancers . . . also, his costume designers seems determined to include the feathery britches in every production), and beautiful, and entirely satisfying. My mother also seemed to enjoy it, which was reassuring because I’d kind of dragged her to it – my father spent the afternoon in a bookstore which is much more his thing than ballet of any description. In between all that culture we managed to squeeze in a cream tea with scones (with jam & clotted cream, obviously) at the Wolseley, lunch with old friends of my parents from when they were first married and living in London (just married & in London was also when they met my godparents; my parents hang on to their friends), lunch at the National Gallery café with my cousin and his girlfriend, a traditional English pub lunch of a Ploughman’s Platter and a pint in a charming little pub perched on the edge of the village heath, and called The Cricketers (can you get more English than this? ), and a post-theater Indian dinner at Dishoom. My parents were, I believe, pleasantly surprised by how much they liked it (which is nice, because it was yet another place I’d kind of bullied them into going to). It wasn’t too spicy for my mother (plus, she got to eat a lot of buttery garlicky naan, and be introduced to the wonders of daal), wasn’t as heavy as my father remembered Indian food being, and I loved that the menu was full of dishes I never see at Indian restaurants at home. Somewhere in between all the museums (museums I hadn’t been to seventeen times before, and whose collections were entirely unfamiliar to me! ), and the food I also found time to take entirely too many pictures of Big Ben and the Houses of Parliament gleaming in the morning sunlight (I consoled myself on my egregiously touristy behavior by reminding myself that sometimes the clichéd touristy things are clichéd for a reason and the Houses of Parliament and Westminster Cathedral are actually impressive and beautiful, tourists notwithstanding), gawk at the Austenesque splendor of Regent’s Street, brave the crowds in Fortnum & Mason to purchase some expeditionary sweets (a pith helmet was not acquired, but might have been useful to combat the hordes of Christmas shoppers), pause to admire the horse guards parading down the Mall, and stop in Aspinal of London for a true Bond Street experience of buying fancy leather goods in a store where I felt vaguely grubby and under dressed (a hunter’s flask for my roommate for Christmas if you’re curious – now we just need an excuse for her to use it). 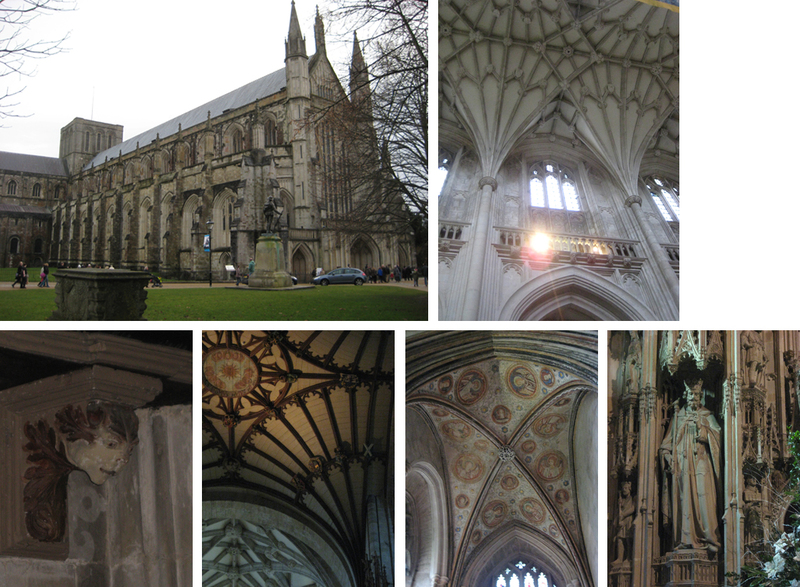 We also took a day trip to Winchester. 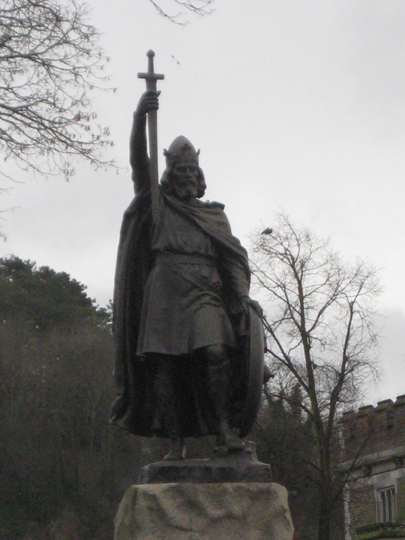 Winchester, for those of you who are a little shaky on your early British history, was the capital of Alfred the Great’s England, and remained the capital until sometime after the Norman Conquest (1066). It is now a charming market town, graced with an unexpectedly grand and rich cathedral, and during the month of December it hosts one of the largest Christmas markets outside of Germany. We slowly explored the Cathedral and then turned our attention to the mulled wine and mince pies being hawked at the market, while I dithered over a scarf and my mother bought me an unexpected Christmas present of small colorful stuffed owls perched on a branch (err, stuffed as in fabric & cotton, not taxidermied) which now hang from my desk lamp at work and make me smile every time I look over. We also picked up eccles cakes from a local bakery while we were in Winchester. Now, I’ve never had eccles cakes before, and I suspect that these eccles cakes were some of the best of the genre, but I also suspect that even bad eccles cakes would be good. Suffice it to say there was a long moment of silence on Christmas morning as we all tucked into our sticky, gooey, decadent breakfast, scraped our plates clean of every last trace of syrup and licked our fingers for good measure. I did not manage to make it to any of the Ottolenghi outposts despite my best intentions. My father did not manage to have his Sole meunière. I’m not sure my mother got to spend quite as much time in a bookstore as she might have liked. And, disappointingly London did not appear to require the Doctor’s intervention this Christmas – believe me I was on the lookout for a blue police box. However, those are just reasons to go back to London. This trip was full of new experiences, and people and places that were half remembered and half forgotten from childhood, and books, and movies, and in summation, pretty much a perfect vacation. Normally I don’t care about whether I make Thanksgiving Dinner because I know that I’ll get my mother’s stuffing, and cranberry sauce at Christmas. But, this year I neither made Thanksgiving Dinner, nor come Christmas was I in a place where my mother and I were going to engage in elaborate meal preparation (there was an entirely sufficient quantity of elaborate food to be had with no effort involved from us). Upon my return home, I rapidly came to the realization that I was not going to be able to make it through an entire year without a plate piled high with my mother’s stuffing and cranberry sauce. It became clear that the only solution was to make it myself, in January, for the first Dinner of 2013. Since this is really a Dinner that’s all about the things I only get to eat once a year, I skipped the traditional sweet potato side dish. I make sweet potatoes in every iteration known to man all the time and I wasn’t feeling a particular dearth of them in my life. Note on timing – this is a meal that is not necessarily technically challenging, but does requires a lot of doing things and then letting them sit overnight. It also requires a lot of things done in advance in the oven that can’t all be in at the same time. Consequently, I ended up splitting the preparation of this meal over three days. This is an America’s Test Kitchen recipe for roasting your turkey in advance and then carving it and reheating it the day you want to serve it. As with most America’s Test Kitchen recipes it is somewhat fussy, gets a lot of pans dirty, and works perfectly. Normally when I do a roast fowl I just serve it cold, but I wanted the full Christmas Dinner experience and that requires hot turkey and gravy so I girded my loins and embraced the fuss. I just focused on carving the turkey breast and mostly didn’t bother with the dark meat except as stock/gravy base, but if you want details on what to do with the dark meat you can find them here. This also makes a delightfully enormous quantity of gravy. It made so much gravy, that in a move I can only assume my mother is going to salivate over, I served it in a jug. If you buy a kosher bird, or your turkey comes with an ingredient list then it has probably already been salted/brined and you should skip this step (and you should feel free to skip this step anyway if you don’t feel like trying to find a pot/bowl large enough to submerge a 6lb turkey breast). Bring 1 cup of the cider, the salt, spices, and bay leaf to a boil. Simmer for 5 minutes, or until salt is dissolved. Add remaining 3 cups apple cider and 4 cups cold water and stir to combine (and make sure that salt really is dissolved). 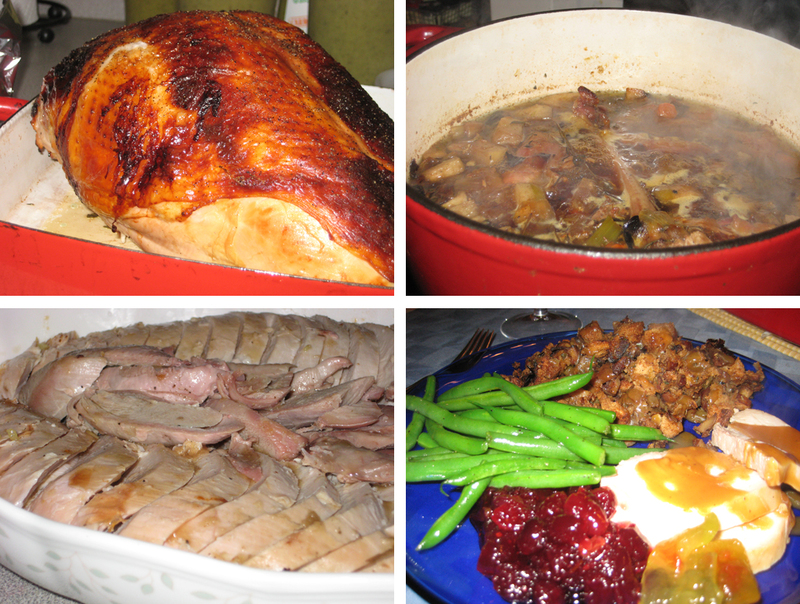 Submerge the turkey breast in the brine and refrigerate overnight. Thoroughly pat dry the turkey breast and dark meat. Arranged the chopped vegetables and chopped apple in the bottom of a large roasting pan (or divide between two roasting pans). Place a roasting rack on top of the vegetables and arrange the turkey breast on it, tucking the apple quarters and orange segments up under the cavity. Arrange the dark meat around the pan (or in the 2nd pan). Brush the skin of the breast and dark meat with the melted butter, and season generously with salt & pepper. Roast for 2-2 ½ hours, or until the dark meat registers 175, and the breast meat registers 160 (your dark meat might be done earlier than your breast meat, so keep an eye out and just remove it from the oven when it’s done). Remove from the oven and transfer the roasted turkey to a wire rack set over a rimmed baking sheet to cool and catch any juices. Either carve some of the dark meat from the turkey legs at this point, or don’t depending on whether you think anyone you’re serving will want dark meat. Allow the meat to cool for 2 hours, then cover tightly and refrigerate. Reserve the roasted vegetables & drippings in the pan(s) you’re going to do something with it in a minute. Carefully peel the skin of the turkey breast away (this is easier than it sounds like it will be). Carve the turkey off the bone (this is so much easier when it’s (a) cold, and (b) you’re only dealing with the breast not the whole bird – it was a revelation). Layer the slices of turkey in a lightly greased casserole, drizzle with 1/3 cup of stock, and top with the reserved skin of the turkey. Tightly cover the pan with foil and place in the oven for 35-40 minutes. Drain the liquid from the dish (or replate the carved meat onto a serving dish), and discard the skin before serving (although, if you wanted you could run it under the broiler to crisp it up and serve it (because everyone knows the skin is the best part). Spoon the roasted vegetables into a large pot (discarding the orange segments, and apple quarters). Deglaze the pan(s) with your alcohol of choice (or I suppose some of the water or stock if you’re alcohol averse for some reason), scraping up any browned bits. Add to the pot. Add the water, stock, bay, and roasted dark meat (I dismembered my thighs a little when I put them in the pot). Bring to a boil and simmer (uncovered) for 1-1 ½ hour, or until reduced to about 5 cups. Strain the stock, pressing on the solids to extract as much liquid as possible. Add any accumulated juices from the cooled turkey breast. Refrigerate overnight (this is important mostly because it makes the next step so much easier). Scrape off the fat from the surface of the stock, reserving 5 Tbsp. Heat the 5 Tbsp of turkey fat (hmmmmmm, schmaltz – is it still schmaltz when it’s turkey not chicken?) in a sauce pan. Add the flour and whisk to form a smooth paste. Cook for 3-5 minutes, whisking constantly, until the roux turns a golden brown. Slowly whisk in the stock and bring back to a simmer. Cook, stirring frequently, until thickened and reduced to about 4 cups (about 15 minutes). Season to taste with salt/pepper, additional alcohol, and/or more cider (I added about ½ cup of cider and several generous glugs of calvados). Can be made in advance and reheated over a low heat, stirring frequently. 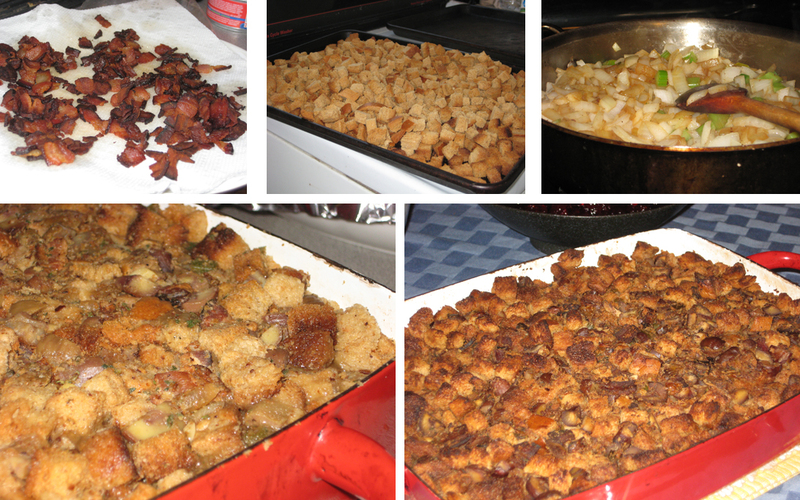 This is (in my opinion) what stuffing is supposed to be. 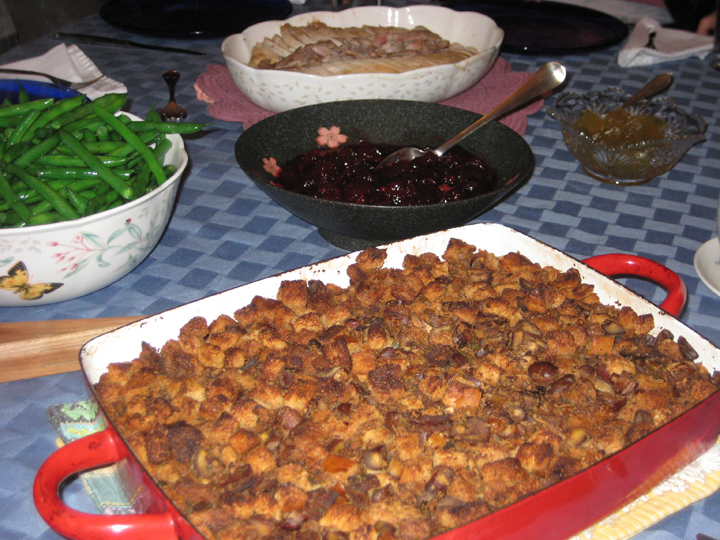 This is to say, this is my mother’s stuffing and the stuffing I grew up looking forward to every year, and as we all know, the only right stuffing is the one your mother makes. Fry the bacon until crisp. Remove to a paper towel lined plate to drain. Spoon off almost all the rendered bacon fat, leaving just enough in the pan to sauté the onions (about 1 Tbsp). Saute the onions and celery until they are golden and caramelized (about 10-15 minutes). Add the herbs and garlic and sauté for another 1 minute or so, or until fragrant. Mix together the bacon, chopped chestnuts, and cooked onions (can be made a day in advance and refrigerated). Toss the toasted bread with the filling and allow to sit for at least 30 minutes to soften the bread slightly (overnight is better). Moisten the dressing with enough broth to make it moist, but not soggy, packing it down with your palms in the casserole pan. Cover the stuffing with foil and bake for 30 minutes in a 350 oven. Uncover and continue to bake for another 20-30 minutes, or until heated through and the top is crispy. Serve with plenty of gravy. I made the cranberry sauce, but not the pickles. I was, however, euphoric that I was able to find the watermelon pickles because they were always an essential component of Christmas Dinner in my house (as in, we used to wrap them tightly in shirts and bring them back in our suitcases from the US and then horde them until Christmas). 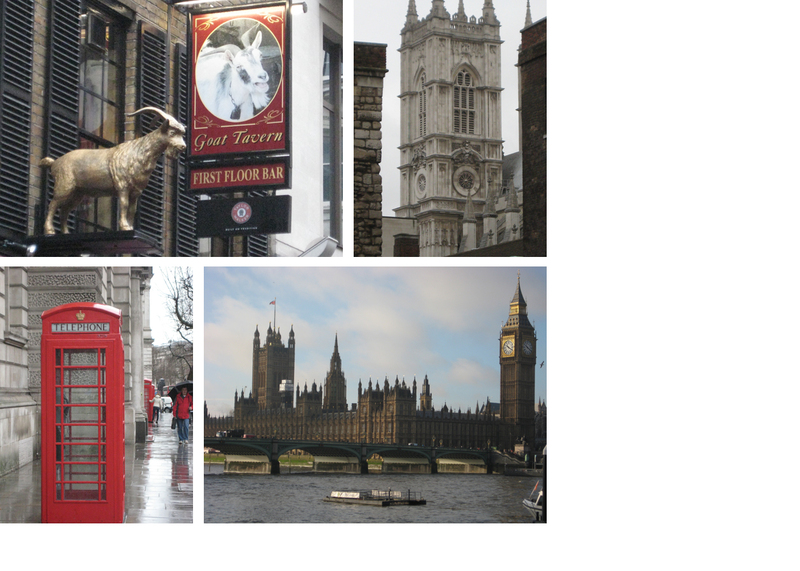 It’s funny to learn that your image of London comes from books and TV. 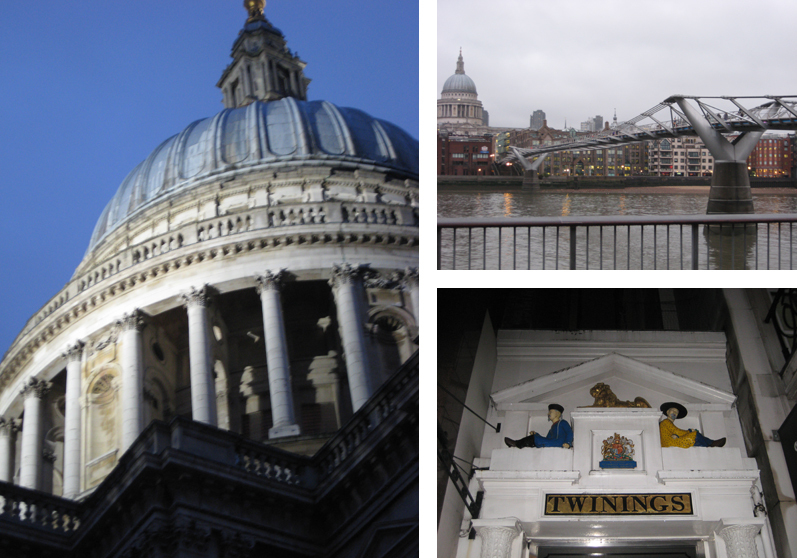 For various reasons, I did a number of different weekend-length trips to London while we were in Edinburgh. At one point I counted and discovered that I’d been there about 6 or 7 times over the course of the year. So I felt like I’d actually gotten to know London a bit by the end, and all these years I’ve just assumed you had too– especially since I’ve heard you talk about your godparents and your parents living there so much. It’s only now that I think about it that I realize that I can’t think of any instances of you going to London (either with me, or without me). It never occured to me that you hadn’t been there! I’d been to London before over the years – because as you say, my godparents lived outside of London for most of my life, as well as a variety of other relatives & friends of the family – but it had been a while, and I’m not sure I’ve ever been there as a (so called) adult. I know we stopped at my godparents on our way up and back to Edinburgh from Geneva, but I’m not sure we actually went into London, or if we did it was really only a day trip to a museum (at some point I know I saw the Sargent Exhibit at the Tate Britain). So, I was familiar with London, but familiar in a kind of hazy memory kind of way, rather than familiar with any kind of crisp clarity. Catching up on your blog. Was interested to read that you had dinner at Dishoom and it was not too spicy for your mother. We went there for lunch the last time we were in London (November 2011) and I found it much too spicy for me. David, of course, loved it as it is his kind of Indian food!